Many of us are good at procrastination: putting things off to some unspecified ‘later’. For some, it’s a minor inconvenience. For others it’s a chronic drain on their productivity. One of the many solutions is eating frogs. 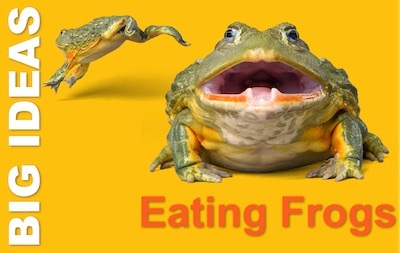 Not literally eating frogs, of course. This is a literary allusion. Although it’s not wholly clear where the credit should go. But in its modern form, Brian Tracy popularised the principle of eating frogs. His best-selling 2001 book on personal productivity was ‘Eat that Frog!’ (US|UK). Toyota is a powerhouse for developing ideas that you’ll find around the world. Take for example, Lean, Kaizen, Seven Wastes, Just in Time, Jidoka, Six Sigma and, indirectly, Scrum. And one more: I give you Kanban. Pronounce Kanban as kaahnbaahn with long aah sounds. It started out as part of Toyota’s ‘Just in Time’ lean production system. The word refers to cards that visibly represented the flow of parts through the manufacturing process. 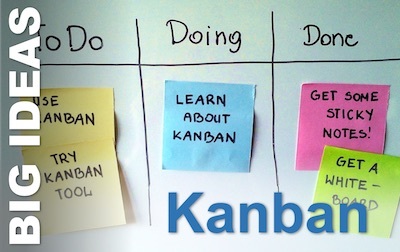 Now, we use Kanban tracking project work. It has risen in popularity over recent years with the rise of Agile project management. It is one of the more popular Agile methodologies. And it’s also often combined with the most popular approach: Scrum. Bruce Tuckman developed a model of group development which is among the most viewed management models on The Management Pocketblog. We cannot wait any longer: we must take a look at his life and work with a wider perspective. 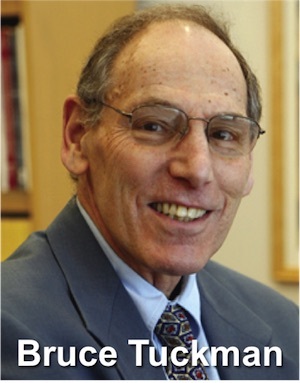 Bruce Tuckman was born and grew up in New York, gaining his bachelor’s degree in psychology from the Renesselaer Polytechnic Institute in 1960, and his MA and PhD from Princeton, in 1962 and 1963 respectively. Tuckman subsequently acknowledged that it was the choice of rhyming names for the stages that he used in his published paper (1965) ‘which probably account for the paper’s popularity’. The terms are certainly memorable and evocative. From 1965, when he moved to his first academic post, at Rutgers, Tuckman started to focus on Educational Pyschology. In 1978, he moved to City University of New York and then to Florida State University in 1983. In 1998, he moved to Ohio State University, as Professor of Educational Psychology, where he remained until his retirement. The group development model for which Tuckman is best-known has been well covered in the Mangement Pocketblog already; so much so that we took the unusual step of creating a portal blog to guide readers to the various articles, at: Bruce Tuckman’s Group Development Model. You can also read Tuckman’s original paper, Developmental Sequence in Small Groups. In 1977, Tuckman was invited to review his original work and, with Mary Ann Jensen (at the time a Doctoral student at Rutgers, with Tuckman, and now a psychologist in private practice in Princeton, New Jersey), produced a review paper (Stages of Small-Group Development Revisited) that validated the original work, and added a fifth stage, Adjourning, ‘for which a perfect rhyme could not be found’ said Tuckman. Many practitioners (this author included) prefer to use the term ‘mourning’ – not because it rhymes, but because it reminds us of the emotional impact of separation and therefore of the role of the team leader in ensuring the team acknowledges the loss. As an educational psychologist, most of Tuckman’s work is of limited interest to a management audience. But one topic stood out for me: the bane of many managers’ lives… procrastination. We all do it. In 1991, while Professor of Educational Psychology at Florida State Univesity, Tuckman published a self evaluation tool to measure tendency to procrastinate. This was a core part of his research into students’ self-motivation in studying. This became a a key plank in much later research which he applied very directly at Ohio State University, where he founded the University’s Dennis Learning Center. They still teach workshops and courses based on Tuckman’s research. All the research related to the learning centre listed on its website is Tuckman’s. Here’s the research paper that caught my eye: at the American Psychological Association meeting in 2002, Tuckman presented a paper that showed how procrastinators get significantly poorer grades in class. What I wonder is this: is it reasonable to generalise that result to the workplace? I suspect it is. Keep a To Do list, but never let it be your primary time management tool. At the end of each day, look at the things on your to do list and decide which ones will be on tomorrow’s To Day list. Put any things that are substantial in terms of complexity, duration or importance into your diary. 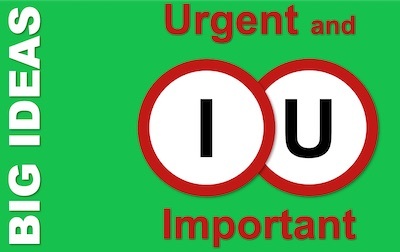 Follow President Eisenhower’s advice and always distinguish what is important from what is merely urgent. Keep a day-book – a notebook that lives on your desk and in which you record any conversations in person or over the phone. As soon as the phone rings, or as soon as you decide to make a call, open your day book, write the date and note the person that you are speaking with and their affiliation. You are now ready to record any comments or agreements. Use a multi-part folder to plan your work a week ahead. File papers in themed folders. If your filing system isn’t working for you; start a new one. But don’t waste time transferring all your old papers into the new system. Instead, just transfer any papers you access in your day-to-day work. Very soon, your old system will become an archive of the materials you don’t need. If you need to make a lot of calls, keep a call sheet, on which you record the person and purpose (and number if it isn’t in your organiser. Fill gaps in your day with a call – or take the sheet with you when you travel. You probably keep a to do list. Do you keep a list of things you have done? Specifically, things you did that should result in something happening: a book you ordered should turn up, a message you left should be returned, a request you made should be fulfilled. Keep a ‘waiting for…’ list so that you never drop the ball by forgetting something. Do one thing at a time. Multi-tasking is not as effective nor as efficient as focus. Redundancy: if it’s important, have a back-up plan. Have spares, have alternatives. Stash a bit of spare cash in every bag you have – and spare pens. Leave early and plan to have a coffee before a meeting. Take reading or work wherever you go. This is part of an extended correspondence course in management. You can dip into it as you go, or you can follow the course, right from the start. If you do that, you may want a course notebook, for the exercises and any notes you want to make. 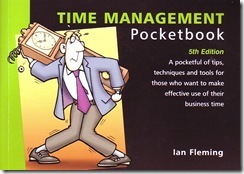 Time management is a vital part of your personal effectiveness. As a manager, you will face greater time challenges than you did as a team member; but you will also have additional resources and greater flexibility in how you use your time. One of the simplest and most powerful time management approaches is John Adair’s Four-D System. This is documented in his (now out of print) Handbook of Management and Leadership. Adair starts with a standard Eisenhower Matrix putting urgency against importance. 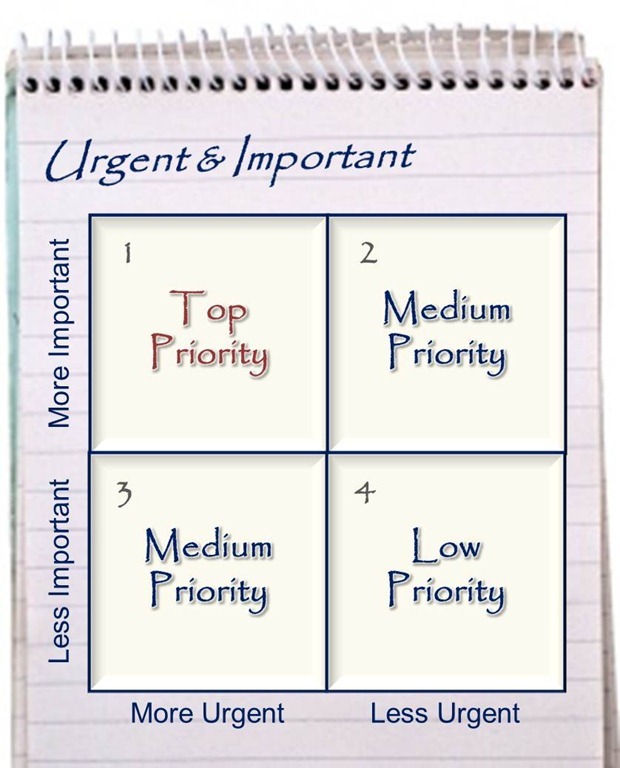 Although the urgency suggests that box 1 is top priority, this creates a high stress, low sustainability work style. Prioritise box 2 and you will find yourself planning and preparing ahead of urgency and so find less work falls into box 1. If it is not worth your time to do it, why is it worth someone else’s time? Yes it may be important enough for someone else to do it, but don’t just Dump it on someone to avoid an assertive NO. Indeed, get in the habit of delegating Box 1, 2, and 3 tasks too, to develop the people who work for you. We’ve already added Dump, but I don’t propose to honour it with emphasis. But Diminish is a powerful strategy. Look at the task and ask: ‘do I need to do all of it?’ If you can reduce the work required and still deliver all or most of the value, you will save valuable time. And there is another D: Decide. You need to decide which strategy to adopt. Unless, that is, you Defer your decision. If you do that as an example of purposive procrastination* it is a sound approach. Make an Eisenhower grid on a whiteboard or on the four panels of a door, or in your notebook. Use post-it type notes to jot down all the tasks facing you (big for the whiteboard/door or small for your notebook). 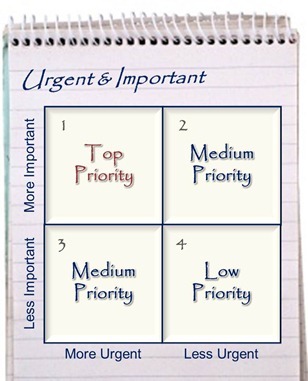 Allocate the notes to one of the four quadrants. If everything is at the top left, re-calibrate your mental scales for importance and urgency. Are you a ‘rush-rush-got-to-get-things-done’ sort of a manager, or are you a ‘take my time; want to get things right’ type? Or are you nicely balanced. Doctors Mike Friedman and Ray Rosenman identified these two styles as, respectively, Type A and Type B personalities. When I tell you they were cardiac specialists, you might start to worry. There is no need. Take the test and then I’ll explain. For each of these nine statements, score yourself 0 to 10 according to how close you lie to the first statement (a low score) or to the second statement (a high score). Friedman and Rosenman predicted that strong Type A personalities would be prone to heart disease and die young. They were wrong. Many of their patients did have a cluster of personality traits that they characterised as Type A, but only a few of them were truly predictive of illness – and not the ones relating to rushing about. However, both Type A and Type B personalities each have their own challenges in operating in an organisation. Let’s look at some. Inevitably, we deal best with people who are like us. We find them easy to understand and their habits agreeable. Type As readily get impatient with Type Bs. They want the B to hurry up and despair that the B has no sense of urgency about things. Type Bs find Type As’ hurry annoying; they would rather the A would slow down and do things properly and are concerned about quality standards. Type Bs will take on the organising and admin tasks as another thing to do carefully and well. Type As – unless they really value it – will rush through it, wanting to move quickly onto ‘proper work’. They will then get angry when they can’t find what they need or get what they want. Type Bs may not welcome an interruption – especially when they are engrossed in something – but when they accept it has happened, they will turn their whole attention to you. This is great for the interrupter and can lead to positive outcomes. But when the interrupter has a non-critical issue, Type Bs can lose valuable time on the work they were doing. Not so Type A’s. The interruption may be unwelcome or a welcome distraction when they are starting to feel bored, but the Type A will soon be tapping their foot, keen to get on. Type A personalities get masses done; often just in time and at breakneck pace. Quality can suffer, especially when they try to multi-task, but it is Type As who are at the heart of the (perfectly true) cliché: ‘if you want it done; ask a busy person.’ Type Bs focus on one thing at a time and do it well. They plan well and execute effectively, as long as they don’t get held up by an interruption or by finding a problem and working deliberately to solve it. The most successful people inevitably balance both personality types. Look at your weak points and note them in your notebook. What strategies will you use to neutralise them? My friends would say that the Slow Movement is one that I honour more in the breach than the observance; but honour it I do. I like the idea of slow food and of taking more time to do things. The witty and wise website of the IINDM; the International Institute of Not Doing Much is not quite so serious! Slow Planet is Carl Honoré’s website, with thoughtful blogs from a number of authors – take your time over this one! BBC Radio 4’s wonderful Food Programme, reporting on the ultimate in slow food, and the joys of food from indigenous communities. I just happened to catch this while driving, and really did slow down, to hear it all. One of the reasons change fails is nothing to do with getting the design wrong, nor the fact of the inevitable resistance that it faces. After all, if resistance is inevitable (and I strongly believe it is) then it cannot alone account for the failure of some changes while others thrive. One major reason why change fails is because we try to make the change too fast. Then, impatient for results, we try and make more change when the first fails. I am not saying that speed in itself is wrong. I am a great believer in making change, calibrating it and then improving, rather than going for perfect first time. Where we need to slow down is by taking the time to communicate better. Make time for people and they will give you better, faster, results. We improve our management, when we slow it down. 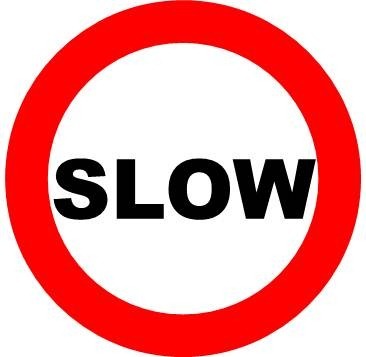 Here are four situations where taking more time can make things quicker – an approach that the emerging Slow Transport approach (‘slowth’) to urban congestion is promoting. When you slow traffic speeds in a congested environment, journey times paradoxically reduce. Have you ever been frustrated by the lack of progress of a colleague to whom you delegated a job? Did you really take the time to brief them carefully? We cannot possibly support or participate properly in what we don’t understand. A lack of knowledge exacerbates fear, so in times of change, make time to communicate relentlessly. Who schedules the work you need, the resources or deliveries your business is dependent upon, or even your own workload? 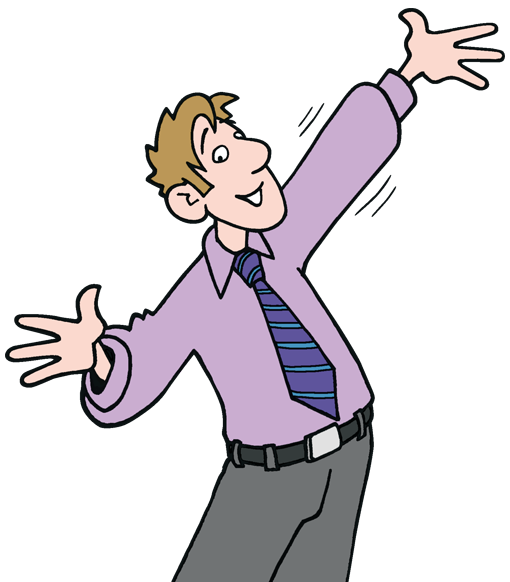 Let’s call this omnipotent being ‘The Scheduling Clerk’. You will want a favour from this person from time to time, so slow down and exchange a few pleasantries whenever you speak with them. They will appreciate it and you will win in the end. You want to make that sale. So take the time to listen to your potential customer. The more you can learn from them, the easier your sale will be. If you rush to present your goods or services, you will rarely succeed. There is a body of evidence now that multi-tasking does not work. There are too many people getting stressed at work – so many that we need a National Stress Awareness Day. We talk about an economic slow-down, but all it means is that we all speed up. It’s December now. The long break and New Year are coming up. Maybe it is time to slow down and think about next year. Maybe it’s time to re-think how you manage. When you slow down, you transform not just what you achieve and how you feel, but the way that others perceive you. Cultivate slow in the right areas of your manner, and you will also boost your personal impact, as a bonus. Learn more in The Impact and Presence Pocketbook. 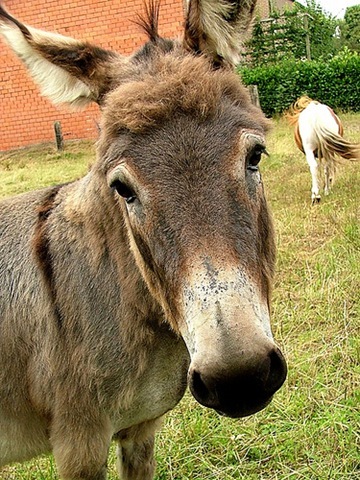 Are you a Donkey or a Dog? 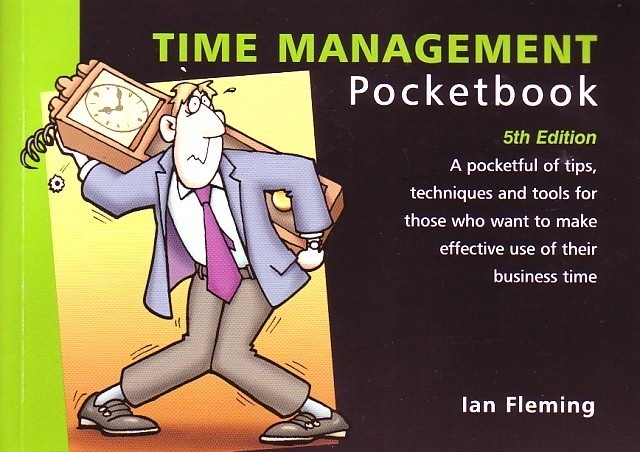 One of the biggest problems in time management is giving your time to somebody else. And yet, we all do it. The consequence is that other people become adept at stealing your time. However, unlike your possessions, I can only steal your time with an accomplice: you! If you want more of your own time for yourself, one answer is to understand why you sometimes find yourself complicit in giving it away. 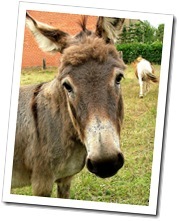 Some of us behave like donkeys. We don’t enjoy carrying other people’s loads for them; but we do it. We do it because it is a habit we have got ourselves into and we have come to see it as our lot in life to be a bearer of burden. No wonder these people look a little sad for much of the time. You are not a beast of burden. It is your privilege in life to make choices for yourself and to reject a burden you do not wish to carry. Some people behave like dogs. They will do whatever somebody asks of them because they are eager to please. They act as if the only way to succeed is to win the approval of others. Often they feel that they are doing everybody else’s bidding because they want to, but the truth is that they are putting their own needs and desires beneath those of the people around them. 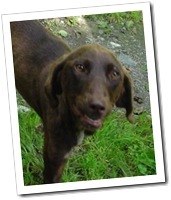 Habitual dogs may be liked, but they are rarely respected. They don’t achieve fulfilment, just a vague sense of having been good to other people. You have one life; get the most from the time you have. Sometimes choose to help out because you feel a sense of duty and not to do so will leave you feeling bad. Sometimes lend a hand because you want to please other people. Sometimes say ’no’ and do your own thing, because you can. It’s your life; your choice. It is filled with great tips on managing what you do, where you work, communications, working with others and general personal effectiveness. Don’t be a donkey or a dog all of the time. Make your own choices and be prepared to say ‘no’ sometimes.